Two-Thirds the Venture: "Aren't you so strong, or is all the weasel in me?" "Aren't you so strong, or is all the weasel in me?" So last winter I said to Nick, "Why is it that we started in the same lane and you've progressed so much faster than I have?" His reply, much to my surprise, was, "Because you're not a weasel like me." Nothing about form, technique, aerobic strength, weight training, etc....just that I wasn't a weasel. Huh? What the heck does that mean? Well, it turns out a weasel, according to Nick, is someone who is competitive but in kind of a sneaky way...like, the people he's competing with don't really know he's competing with them, but slowly they catch on that he's tracking them or taunting them just ever so slightly, daring them to see his bid and raise him...so they start to speed up too and anti-up, giving it right back...so that in turn causes The Weasel to work even harder at whatever he was trying to win at in the first place...and as you can imagine, this has had quite a positive effect on Nick's swim times...and is thus the reason he has improved faster than I have...and the reason he has legitimately (and affectionately) earned the name "Weasel Boy." But the question remains: Should I try and gain a bit of a weasely edge, especially if it's going to make me faster? So I've watched Weasel Boy for several months now and I've thought long and hard about my Junior Weasel status, and what I think is that I can definitely nurture it a bit...not in a negative way, just in a sort of grow-the-ego kind of way. I think it's doable from more of the leadership kind of standpoint I was talking about the other day. I want to have more confidence in myself and to know that I can compete and I can excel and it doesn't have to be enough that I just finish the race...I think some of my expectations for myself have been limiting me. The sky is the limit...so why have I only been aiming for the horizon? Anyway, on reflection, and with reference to your wonderful post, I think that weaselitude isn't always the best thing. 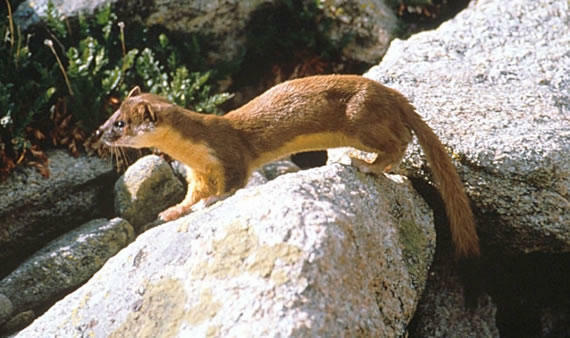 The only reason I realised I really WAS a weasel was because our great swim coach pointed out that I might be faster if I stopped looking from side to side all the time! "I wish I could be openly competitive, but I'm not good enough to really declare it" - What kind of phiolosophy is that for a person?!? You're much better off the way you are, trust me! What a great and funny post! You definitely have something there. Competitiveness can be an awesome motivator at times. Just read about the hundreds of athletes that finish races by concentration and picking off the runner or biker directly in front of them, only to move on to the next target. It takes your mind off of the big picture, which at times, can be a tad daunting! I finally got here (from your comment on my "Triteacher Unplugged" post). Catch the weaselitude!